A scripture we normally read over fairly quickly is the above passage in Matthew 27. The main reason we do not spend a lot of time on this story, incidentally only found in Matthew, is because of the part in verses 52 and 53 where tombs are broken open and dead people come to life. Since that is something we have never witnessed or heard of happening, it causes us some problems in trying to explain what and how this might have occurred. One amazing fact that we often overlook because of the quick read, is the fact that these resurrected people only appeared after Jesus’ resurrection, three days later! Only after Jesus’ resurrection did these holy people go into Jerusalem and witness to people. Where did they go for three days and is the fact that they appeared only after the resurrection significant? The answer to this question is a resounding, “Yes”! These people were the first fruits offered to God of eternal life for the believer. Jesus himself was raised on the day the the Jews celebrated the Feast of First Fruits (see Exodus 23:14-19). The Feast of First Fruits had, at its center, the idea that you gave to God the very first harvest of your crops as a way of saying, “I trust you to provide and protect the rest of the crop to me at a later date when the full crop is ready to harvest.” Paul says in 1 Corinthians 15:20, “Christ has indeed been raised from the dead, the firstfruits of those who have fallen asleep.” (also read the next two verses, 1 Corinthians 15:21-23). Christ was the guarantee of the resurrection of all God’s saved and redeemed people and these first holy people were resurrected as the first fruits of that promise of eternal life. We have this promise in Scripture that God resurrected these people and will also give us that same resurrection from the dead. Another interesting piece of information is that every major city in the Roman world had three parts. As you approached the city you first came to the graveyard, called the necropolis. Next was the city itself, called the polis, and finally came the acropolis, the high place that was fortified to withstand assault. Now, read 1 Thessalonians 4:13-18 and picture in your mind Christ returning and picking up the dead in Christ – first on the outskirts of the city and then coming in to the city and picking up the living and taking them up to meet with him on the high place in the clouds. What an exciting picture of the hope that we have in Christ and a great thought for the upcoming Easter Sunday! The only miracle in the New Testament where the disciples say, “Truly this is the Son of God”, was the miracle of Jesus walking on the water (Matthew 14:23-33). Could the reason for this be found in the Hebrew bible? In Job 9:8 it says, “He [God] alone stretches out the heavens and treads on the waves of the sea.” What about Psalm 107:28-30, where it says, “Then they cried out to the Lord in their trouble and he brought them out of their distress. 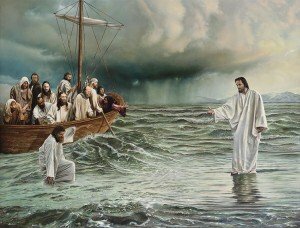 He stilled the storm to a whisper; the waves of the sea were hushed.” Also, in this story, Jesus walks by the boat on the water. Listen to the next passage in Job 9:11 talking about God. ”When He passes me, I cannot see Him, when He goes by, I cannot perceive Him”. Could it have been that those disciples knew their Text and realized that God was present among them because Jesus had done what the Text said God alone could and would do? The miracle of calming the sea does not necessarily prove that Jesus was God. Moses and Elijah also performed miracles with water. What made the miracle so profound was that He walked on the sea and by doing so, according to the Text, claimed to be just like God. Also, like the Jonah story (Jonah 1:4-6), both Jesus and Jonah were asleep in the bottom of the boat, just before the storm was calmed. The disciples must have thought, “It’s happening again!” However, this time, the greater Jonah (Jesus) went toward His mission from God instead of running from it. How many times have we seen this happen in Scripture where something that Jesus did was fulfillment of the Hebrew text? The Bible is one long interwoven thread – we just have to study it enough to be able to trace the cord!